The first of a series of spotlights on some of David J Markham's most recently displayed works at Gallery 42, starting with Tadcaster's own St. Mary's Church. Wishing all our customers a happy new year & featuring information about the gallery space's current rotation. Northern Artists exhibition now open! We'd like to extend a massive thanks to everyone who came to our preview evening last night and also to Opt In, for providing wine and refreshments and fitting in seamlessly to create a wonderful environment for all. It was great to see new and old faces alike; we hope you all had a great evening and enjoyed the show! Last night, on Friday 11th April 2014, Northern Artists opened with a bang! The minute the clock turned 7, the gallery saw the first guests, then the second, the third and before we knew it, a great mix of folk who had all turned out to see the most anticipated Gallery 42 show in a long time. Opt In had several lovely representatives with us, promoting their charity's work and supporting our preview evening with wine and gorgeous canapés for everyone to enjoy and guests gladly donated to their great cause, which you can read more about here. Dave Markham arrived early on to promote not only his work, but the show as a whole, as did Dave Newbould, who has several works in the show. Unfortunately Allen Tortice was unable to make the preview evening at the last moment, adding yet another (if unplanned) degree of enigma to him and his work. Needless to say, pictures are already being snapped up, so get yourselves down as soon as possible to avoid disappointment! We look forward to meeting you and sharing with you the great Northern Artists. 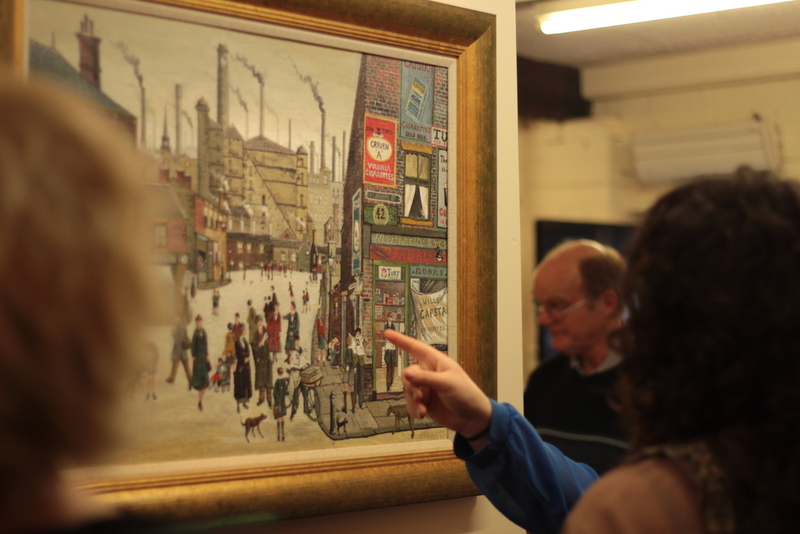 Guests examine Allen Tortice's largest work yet and perhaps his masterpiece - Our Town.